The February talk on The Severn Railway Disaster was given by Paul Barnett, a maritime historian and former Royal Marine. Paul became interested in the bridge disaster when he failed to find documentary evidence to support the stories about the event circulating in the area. The research that he undertook resulted in an exhibition in 2010 to mark the 50th anniversary of the disaster. It also led to the erection of two memorial stones on the banks of the Severn, one at Lydney Docks and one at Purton. 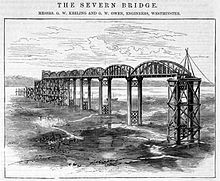 The bridge was constructed between 1875 and 1879 by the Severn Bridge Railway Company primarily to carry coal from the Forest of Dean to the docks at Sharpness, the Lydney docks being too small to cope with the growing volume of trade. It continued in use for freight and some passenger services until 1960, the time of the disaster. It was designed by George Baker Keeling and constructed by Hamilston’s Windsor Ironworks Company Ltd of Garston, Liverpool. 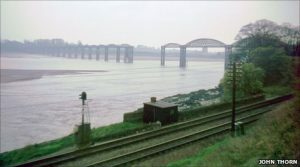 The bridge carried a single track railway and trains had to complete the return crossing from Sharpness to Lydney in reverse. It had been hoped that the line would attract tourist traffic as well as local passengers but seven years later the Severn tunnel was opened and, from early on, this threatened the bridge’s financial viability. s covered by insurance could have had something to do with the number of collisions. The bridge was, after all, on the route of vessels heading for the breakers yard. On 25th October 1960, two tanker barges, the Arkendale H and the Wastdale H collided in heavy fog near Sharpness. Both vessels had missed the entrance to Sharpness harbour and found themselves further upstream than they should have been. The result was that they had to battle against an incoming tide to regain the harbour entrance. The estuary narrows to the north of the harbour entrance and consequently the tide runs much faster at that point and has a back eddy. The skippers of the vessels lost control, their barges collided and as a result crashed broadside into pier 17 of the bridge. Part of the bridge collapsed hitting the barges. The Arkendale was carrying 191 tons of black oil, the Wastdale 252 tons of petrol. The result was a serious conflagration with five of the eight men on board the two vessels losing their lives. It could however have been even worse for, three days earlier, work had commenced on strengthening the bridge and, prior to the commencement of the programmed welding, the gas main which ran across the bridge had been disconnected. It was also fortunate that the six British Rail men employed to strengthen the bridge were off duty and busy listening to a boxing match at the time or they too could have been caught up in the disaster. The accident left a 168ft gap in the 4,162ft. bridge and it remained in this state for seven years while decisions were made about whether to repair or demolish it. The decision had finally been made to go ahead with repairs when a capsized tanker caused further damage to pier 20 and the extra cost that this would have incurred made repair uneconomic. The decision to demolish was taken and demolition was completed between 1967 and 1970. Today all that remains to be seen are several piers on the embankment and, at low water, the wreckage of the two barges which remain on the river bed. The bridge had been of a box girder design with only one other, the Tay Bridge, being of a similar construction. This too had failed leading to the Tay Bridge disaster of 1879. During the course of Paul’s investigations some fascinating memorabilia came to light. The first was a set of thirty-nine glass sepia photographic plates that had been taken by Keeling in the early days of the bridge’s construction and had been used by him to publicise the project and to raise sponsorship. They had been rescued from a skip by someone who was fortunate enough to be aware of their significance. Only one other set of plates is known to exist and this is in the possession of the Cardiff Institute of Engineering. The second find was a painting of the bridge measuring 14ft. by 4ft. 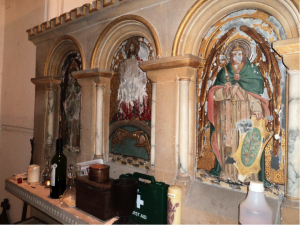 It was an artist’s impression of the project prior to construction and this too had been rescued from a skip! It is known that investors in the project were each to be given a painting of the bridge and seventy-two watercolours were commissioned. Could this painting have been one of them? It seems possible. In spite of a having a long journey back to Gloucester, Paul stayed for refreshments and spent time enthusiastically talking to members and answering questions. A lively and informative talk about Friendly Societies was given at the November meeting by Philip Hoyland. Philip explained that Friendly Societies were established at the end of the eighteenth century to enable the working man to cover the costs of medical care, any periods of unemployment nd to pay for funeral costs. In 1793 the Friendly Society Act was passed requiring Friendly Societies to be licensed and John Tidd Pratt became the Registrar based in London. Records show that by 1801 five thousand societies had registered and that four years later in 1805 the number had increased to ten thousand. By the beginning of the twentieth century six million people were using the system and funds had increased to £14 million. The friendly societies were the precursor of the National Insurance System and, at a time of increasing unemployment, had become very important. So, how did the system work? Working men were eligible to join a Friendly Society between the ages of 16 and 35 but they could then remain members for life. They had to pay a subscription to belong and this varied from 8d to 1/- a week paid monthly. Fines were imposed on anyone who got behind with these payments. Members also had to pay for their own rule book and brass pole head and provide 4 gallons of cider at the first meeting they attended. The money collected was kept in a strong box by the treasurer and disbursed at times of need. Medical expenses would be covered where necessary and if a man was too ill to work he would receive sufficient funds to survive. At a time when the average weekly wage was 11/-, the average pay out would have been of the order of 6/-. A steward was appointed from among the club members and was required to make a weekly visit to anyone claiming sickness benefit. This ensured that there were no malingers but it was not a popular task and many preferred to pay a fine rather than perform it. On a man’s death, his widow would receive £2 to £3 to cover the cost of his funeral and members would also have a whip round for her. If a wife died a man would receive £5! Clearly his loss was considered much greater than hers. Friendly Societies would also lend money at no or low rates of interest and if calls on the funds had not been great for a period of time and money had accumulated there might be a share out rather like a dividend. Societies therefore performed some of the functions of a bank. Societies, or clubs as they were often called, would meet once a month in a club room. This was often in a pub and everyone there would be entitled to 2d worth of beer. This must have led to quite a convivial atmosphere and possibly accounts for the poor reputation that club nights developed among the upper echelons of society. In spite of this reputation, members had to adhere to the rule book and standards were high. Rules varied between societies but misdemeanours such wearing a hat, playing certain games such as marbles or quoits, bringing a dog into the room, rioting or wrestling and even adultery could all incur fines which were then added to society funds. Once a year there was a very important Feast Day, Club Day or Walking Day as it was sometimes called, the costs of which were paid for out of funds. The men would gather in their club room dressed in their best clothes (no smocks were allowed) and wearing a sash and a flower or tutty in their button-hole. 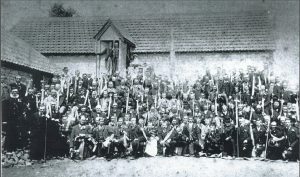 They would then march to church beneath their club banner each man holding his club brass aloft on a long pole and they would be accompanied by a brass band. The church service would be followed by a procession round the area visiting all the big houses where further donations would be made to club funds. Following that, the serious business of the day began with a massive feast and much drinking. There was also a variety of entertainments to follow the feast. These might include dancing, games or even a fair. rlier guilds. 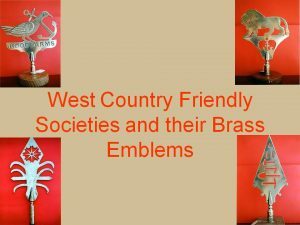 Local brasses were made in the Bristol or Bridgwater foundries and the cost to each man would have been of the order of 1/6. This would have been quite a considerable sum of money atthattime. The design of the brasses was often related to the location of the club room. If the location was in a pub then the pub name would be depicted. In Combwich the club room was at the Anchor Pub so the brass was in the shape of an anchor; at Kilve they met at the Hood Arms so the brass was a chuff and anchor – the Hood family crest etc. etc. 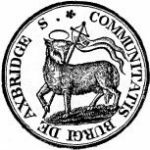 There were also female friendly societies, some of which in this area were established by Hannah More. How they were funded is not clear as subscriptions were only ½ d a week but Hannah More may well have contributed financially to them. On marriage a woman would receive 5/-, a pair of stockings and a bible. At the time of ‘lying in’ the benefit was 7/6. The Friendly Societies continued in this form until 1948 when Aneurin Bevin who, for many years had been involved in his local variant of a Friendly Society the Tredegar ‘Sick Club’, introduced the National Health Service, or as he put it, “Tredegarised the nation”! Since then Friendly Societies have become less important but many still exist and still process to church once a year. Their function today is as fund raisers for charity. Philip completed his talk by explaining how he kept his stunning collection of brasses in immaculate condition. It seems that a combination of Betterware paste and a product called Renaissance will preserve the surface without abrasion and the inevitable loss of surface decoration or the use of elbow grease. The autumn programme started this year with a talk from our president David Dawson. David’s research into the analysis of excavation pottery has the potential to revolutionise our understanding of the past and it is no wonder that his talk drew an audience from a wide area. David started by describing in simple terms how to process excavation finds before turning to the more complex matter of identifying the form and fabric of a pot. These two elements of the process can help to determine not only age and function but also where a pot was made and how far it has been traded. Context, he emphasised, is everything. Without this it is impossible to make a valid interpretation. Since the 1960s, the main method of identifying the fabric has been the ‘eyeball method’ preferably with the aid of a magnifying glass, although David rarely seems to need this. The late Professor D. Peacock of Southampton University improved on this method by taking thin sections which could be examined under a microscope and, while this was useful for identifying the temper or inclusions, it did not help greatly with the identification of the clay matrix. The Peacock method was followed by the I.C.P. method or Inductively Coupled Plasma method using Atomic Emission Spectroscopy. This method does identify the minerals even those in the clay matrix but it presents the results as a list of tables which are not always easy to interpret. The latest advance which David has been spearheading is called Quemscan and is being developed in conjunction with the Camborne School of Mines. Quemscan is an automated scanning system which has been used to analyse rock samples from the moon. The technique produces a visual map of what is in a sherd picking up the matrix as well as the inclusions and it also produces pie charts showing the percentage of every mineral that is present. Results to date have shown some interesting correlations between the pottery found in Westbury-sub-Mendip and variously Wells, Chewton Mendip and Hope Wood, Ebbor Gorge. Common types appear to have been traded widely while others were made locally from local clay and local temper much as still happens in Africa today. David also took the long view of pottery manufacture commenting on the Ceramic Revolution that took place between 1450 and 1650. During this period, ceramic imports increased bringing new forms and functions as well as new types of decoration. It is also possible that potters came too, fleeing religious persecution at home. Whatever the cause, forms and glazes diversified at this time and the country potter flourished until, in the nineteenth century, the process became industrialised and brick and tile manufacture evolved to meet the needs of a housing boom. We have been privileged to hear David talk about this development while still in its early stages and shall wait with eager anticipation the further insights that are sure to emerge as more results become available. The summer programme began on Sat urday May 20th with a visit to Christon Church. Christon is a small village on the southern slope of Mendip and at the foot of Flagstaff Hill. It looks across the Lox-Yeo valley to Crook Peak and as people gathered many commented on the stunning setting and how tranquil and peaceful the valley must have been before the coming of the motorway. The tour of the church of St. Mary the Virgin was led by the Reverend Ken Brown, former rector of the parish, who endeared himself to us early on by denying all responsibility for the wet weather with the observation that ‘Weather’s management, I’m only sales’. Sales or not, he made an excellent tour guide, pointing out among other things, signs of Saxon herringbone masonry possibly dating from about 1050 AD and in the entrance the superb late Norman arched door opening with dog-tooth decoration and a Greek key-pattern design. See photograph. Internally there is a 3-cell church: a nave, a bell tower and a chancel with the bell tower being the central cell. Between the nave and the bell tower and again between the bell tower and the chancel are further Norman arches both with the characteristic zig-zag decoration and the Greek key-hole design. Medieval glass survives in the south window of the bell tower and four magnificent dragons, one at each corner of the tower, support the heavy groins of the vault above. window but Reverend Brown unlocked the door into the vestry so that we could see the original altar with its painted panels. See photograph. After the visit we sheltered in the porch until the rain had eased and then set off to explore the earthworks on Flagstaff Hill. We walked up the hollow way that is Flagstaff Road noting the house platforms, then out onto the hillside itself where early trackways were followed and field systems explored. The medieval ridge and furrow on the top of the hill was located and lynchets found on the north side of the hill that preserve early strip fields that may date from the Iron Age. Detailed examination of the many house platforms and trackways was curtailed by the arrival of a new wave of rain and a hasty retreat was beaten leaving people to comment that a return would be welcomed but in better weather. Some additional material by Elizabeth Friend. Stained Glass windows – Joseph Bell studio, Bristol. According to the pamphlet available in the church, the stained glass in the west window in the nave depicts Faith, Hope and Charity, as shown by the emblems held by the figures, and is the product of the Joseph Bell studio in Bristol. From the same studio on the opposite north wall is a post-war memorial window depicting sergeant Durrant, a bomber navigator who was killed in a raid on Kiel canal. He is shown in full kit with a map of the German port below. His mother served as a VAD in London. In the south wall there is a small window of medieval Somerset glass. The eagle and book depicted there is the emblem of St John the Baptist. Joseph Bell (1810-1895) founded his studio in the 1840’s and it continued to be run by his son (Frederick Henry Bell 1847-1899) and grandson (Frederick George 1878-1967) until 1923. Each generation was involved in the design and painting of the glass, with additional artists brought in to design and make commissions. Joseph Bell & Son was later sold to Arnold Robinson, who had already undertaken commissions for the firm. After his death in 1955, Basil Barber, who had previously worked as chief cartoonist for Ninian Comper and had joined the studio in 1953, ran the firm until Geoffrey Robinson, son of Arnold Robinson, took over the firm in 1959. The studio closed after Geoffrey Robinson’s retirement in 1996. 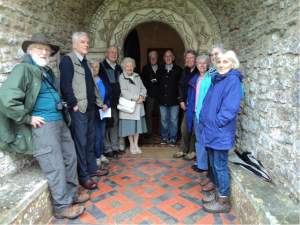 On Wednesday 19th April Hazel Hudson described to us some of the many discoveries in the field of archaeology and local history that have taken place in the parish of Wedmore. She herself has been involved in and often instrumental in the discovery of many of them since her first encounter with archaeology as a sixth former at Sexey’s Grammar School, Blackford in the 1950s. However, taking a chronological theme, she began her talk with the discovery in 1893 of dinosaur bones in the late Triassic deposits being quarried on the hill top close to the Mudgley Road. These bones proved to be unique in that they predate the more well known dinosaurs of the Jurassic and also in that they represent two dinosaurs that have not, as yet, been identified anywhere else in the world. They have been named Avalonia sanfordia and Picrodon herveyi after the men who discovered them. These bones are now on display in Taunton Museum and must surely be worth a visit. Following this, Hazel described the discovery at Heath House of a variety of artefacts – two Bronze Age Palstaves, three Bronze Age torques and a number of amber beads. The last of these, the beads, must have come from the Baltic. Moving into the Neolithic, a trackway across the levels has been found near Blakeway Farm and this trackway c. 2500BC, made of hazel rods, shows the first evidence of coppicing yet to be identified in the country. More than twenty sites have been located from the Roman period and Roman field patterns have been observed on the levels between the Isle of Wedmore and the Mendip Hills. Roman salt pans with their accompanying briquetage have also been found in the Westhay Moor area to the south of the Isle of Wedmore. Evidence of the Saxon period is less clear but in 1853 Tucker Coles discovered a Saxon pot in St Mary’s church yard containing over two hundred silver pennies. Declared treasure trove, most are now in the British Museum but a small number can be found in Taunton Museum. The coins were minted in Lincoln and have been attributed to the reign of King Canute. In 1989, a Saxon ring dated to 5-600 AD was also discovered near the Cheddar Road. The ring consisted of strands of copper alloy wire twisted together. Hazel has a copy which she wears regularly but the design is so charming that gold copies are now made in Wedmore. Moving to the Norman period, the area seems to have been favoured by the church hierarchy. The site of a Bishop’s Palace has been located and excavated in Blackford and it has been suggested that it was demolished in the late 1300s because it was thought to have been too sumptuous. A grand religious establishment has also been found at Court Garden in Mudgley. First recorded in 1176, it is believed to have been built in the 1100s and to have belonged to the Dean of Wells. Pottery has been found on the site from the twelfth through to the fifteenth centuries. A piece of slate has been found that has musical notation inscribed on it, possibly dating from the 1400s. Is this another first for the area, I wonder? Other exciting locations include Fernhall Farm, Mudgley, which has shown evidence of occupation from the Mesolithic through to the Present Day and the Old Vicarage, Wedmore, with evidence from the Roman Period onwards. Gog’s Orchard, Wedmore, has produced evidence dating back to the Iron Age including a Roman burial from the 2nd or 3rd century with, as a result, the need for the housing development there to be built on concrete rafts to preserve the archaeology beneath. Finally, Hazel described a number of details about St. Mary’s Church, Wedmore, many of which had been first noted by Jerry Sampson. She concluded her talk with the observation that the site of the Manor House next to the church was most probably the location of King Alfred’s court in Saxon times. But, perhaps our own thoughts at the end of her talk must have been to wonder at the extent of Hidden Wedmore that she had revealed to us and to speculate on the excitement and fun that she must have had over the years in helping to uncover it.